6 w/King, 1 w/2 Bunks, 1 w/2 Pyramid Bunks. Sheets & Towels Provided. 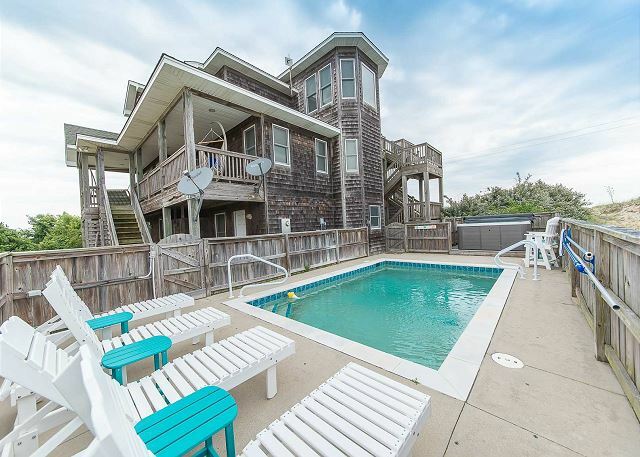 Take the road less traveled and vacation at this coastal getaway! 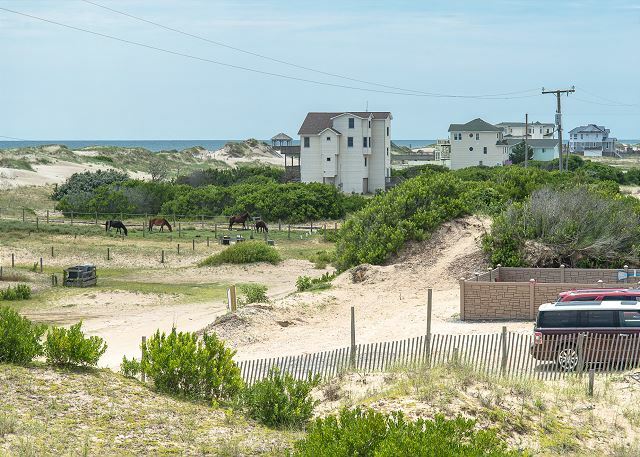 Barefoot-beach is a spacious and well-equipped home ideal for families and four legged friends to slow down and savor life. 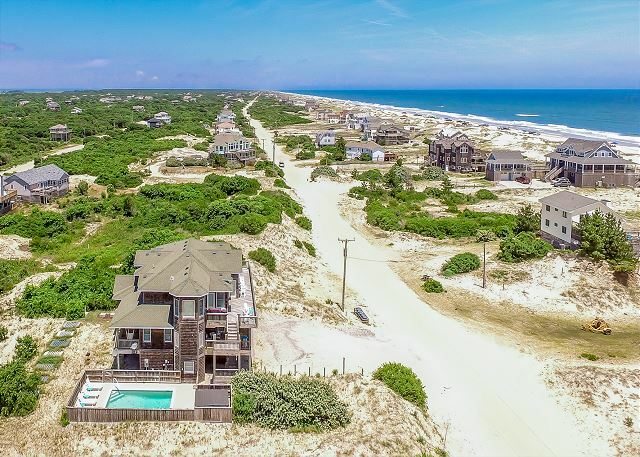 Nestled on one of the most exclusive sections of the 4x4 beaches, this home provides magnificent ocean views and limitless opportunities for relaxing in this unspoiled beach paradise! 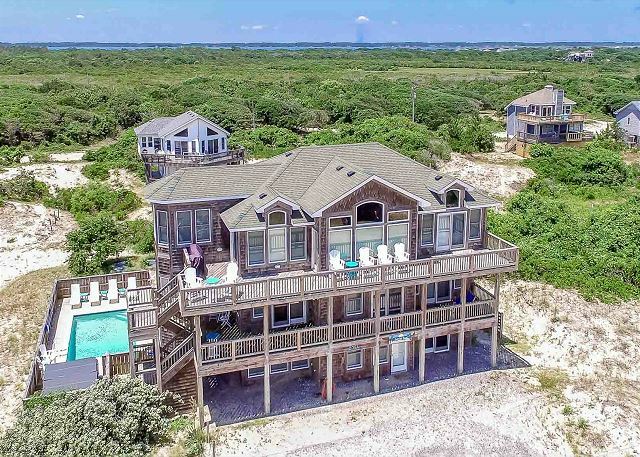 Barefoot-beach is an eight bedroom, elevator equipped home that features, southern comfort style, 6 King masters all with access to the decks where you can watch for dolphins navigating the ocean waves or wild horses running in the sand. The first-floor offers two bedrooms with bunk beds perfectly themed for the “little vacationers” in the group! The Game room is filled with many extras, including a 14ft. shuffleboard, full-size arcade game, 9ft. pool table and a theater area including a popcorn machine, making for fun-filled evenings after a relaxing day at the beach or by the pool. 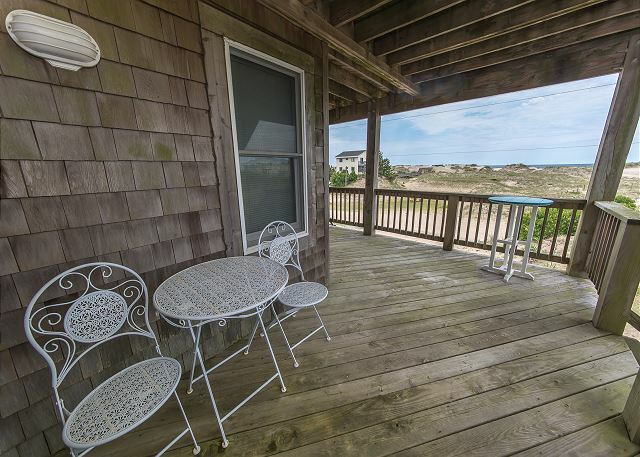 The top floor offers all the comforts of home and then some plus ocean views galore! An open floor plan with tons of natural light, plenty of comfy seating and a separate lounge nook area. Kitchen features top-end appliances, fully stocked with double everything, including Nutri-bullet, coffee makers, Keurig 2.0 and much more, one dining table seats 14, another seats 8. 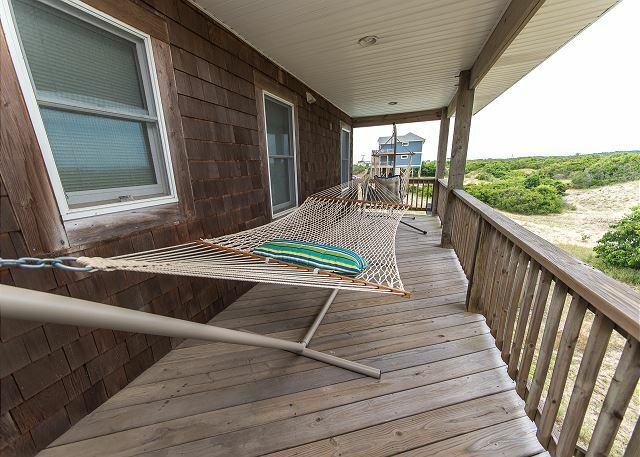 Barefoot-beach is the ideal location for making lasting vacation memories! 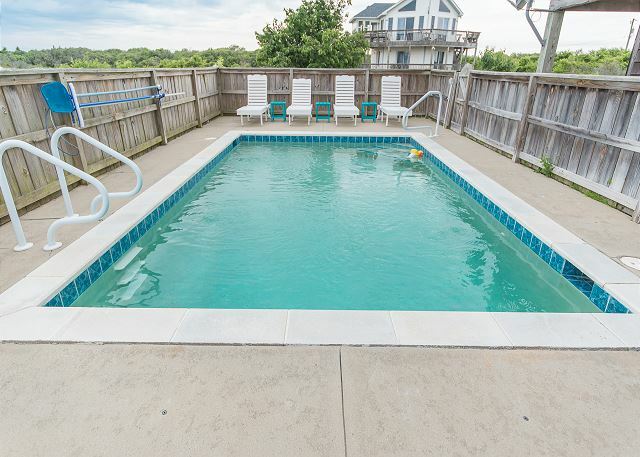 After soaking up the sun at the beach, you'll love to refresh in the 15'x25' private pool! Don't forget to wash off all the sand in the outdoor shower! 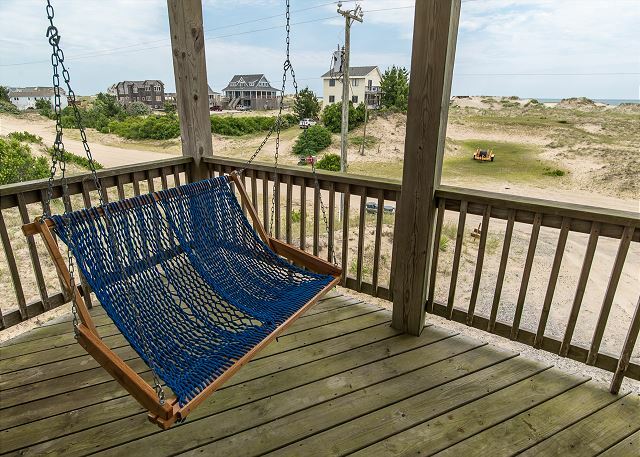 After the sun sets, unwind in the jetted hot tub or relax in one of four porch hammocks! Or you may prefer an evening inside - the theater room will make for a cozy evening! The theater room is stocked with videos and is streaming capable. If you prefer a quiet evening, grab a book from the library and enjoy a good read! Prepare family style dinners on the Gas smoker, charcoal grill or in the fabulous kitchen and enjoy plenty of outdoor dinning space for dinners with a view! NOTE: Fireplaces shown in pictures are non-functional. The house was awesome! Location was great. Horses hanging out daily in our yard was so exciting for all of us! It was a memorable experience! Loved it! Thank you for your awesome review! We are thrilled that you enjoyed your stay with us at Barefoot Beach. We rented this house for a family reunion. The location was beautiful and we enjoyed seeing the wild horses run about. The house slept all 20 of us perfectly. The pool was clean and refreshing. The property description is accurate regarding the location. The 4x4 beach is a little tricky to drive upon until you get the hang of it. Definately need to deflate tires!! The house was clean and well stocked. The rental agency was helpful and checked in with us during our stay to make sure everything was to our liking. I would definately recommend this property to friends/family. The only thing that needed attention was the wasps. They liked to make nests on the decking. But regular spraying should take care of that! Thank you for sharing your experience with us. We are glad that you and your family enjoyed your vacation! We really hope to see you again in 2019! This house was exactly as pictured. It was spacious, had beautiful unobstructed ocean views and was well laid out. The issues we had were minor and to be expected at a beach rental house. The well water was strong smelling, outdoor shower not working, ice maker not adequate for a house of that size, but none of these things really impacted our stay. The important things were there and we had a wonderful time even if the weather didn't cooperate. I would absolutely return to this house in the future. We enjoyed our stay at Barefoot Beach. Because of the storms the sand was a bit harder to maneuver than in past years on the 4x4 beach. It was about 20-30 mins driving from the road to the house which was challenging depending on the tides. House was very nice but the well water smell was quite strong. The ice maker in the fridge and additional ice maker in the island were not functional causing some additional trips to the store. Only other improvement i would recommend is to clear out the bees along the deck areas, we were unable to use any of the swings or hammocks due to bee nests. The pool area was great! 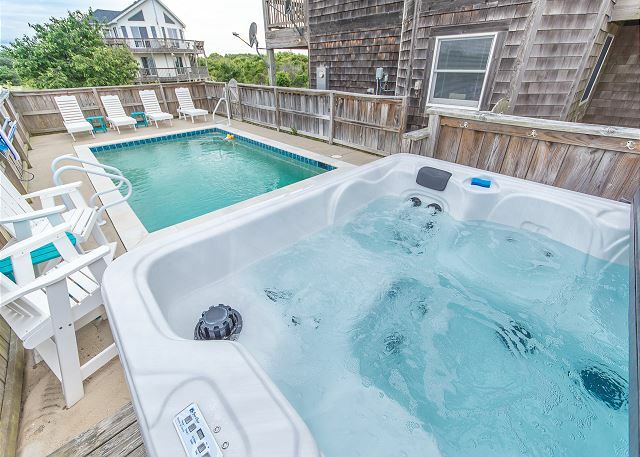 And it was by far the largest hot tub we have seen in our stays in OBX. The horses really did get very close to the house and that was very enjoyable for the kids in our group. We enjoyed our vacation very much. Except for the few things I have all ready told you about. It was just fine. Some in our group wished it would not have been so far down the beach. They would of liked to be closer to town and shopping. But I for one went to the beach to enjoy the sand and ocean. I would come back again. Beautiful house with gorgeous views. We saw wild horses from the balcony in the morning as we sipped coffee! The overall property is maintained well, however, we did notice several things that needed to be fixed or better communicated. We arrived after a five hour drive around 6pm and were ready to unpack and start the grill for dinner. No propane in either tank. We called the property management company and were told we could go get the propane ourselves and get reimbursed or they would send someone in 24 hours. Really? We were not happy about this since we had specifically inquired about the propane prior to even leaving for the trip. Additionally, none of the beds were made up with sheets and the towels were not in the bathrooms. We had to call the management company again to find out where they were. They were located in bags on the first floor. There were some small maintenance issues, such as the sink in the upstairs bathroom was clogged, the smoker knob was broken and several other small issues. Overall great property, but I was not super satisfied with the support we received from the property management company. The house is beautiful and well equipped for large families. The downstairs area for the children was excellent to provide space for everyone. Horses came right up to the house each day, which was wonderful. The only negative was the internet was very slow and the drive from the house back to 'town' became a bit tiresome as the week went on. Overall, it was a wonderful place and I would recommend it. 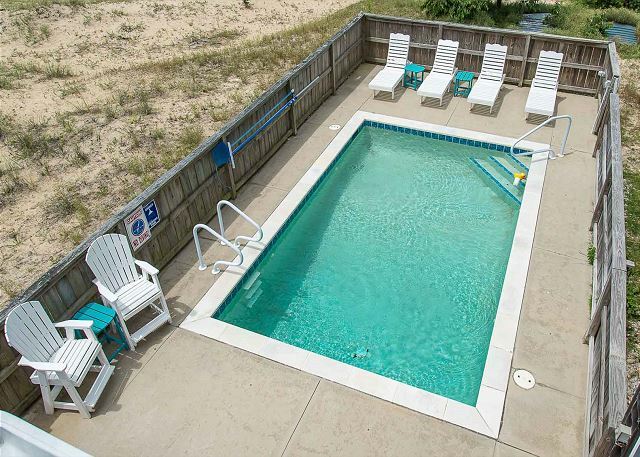 Glad to hear your family enjoyed their stay at Barefoot Beach! 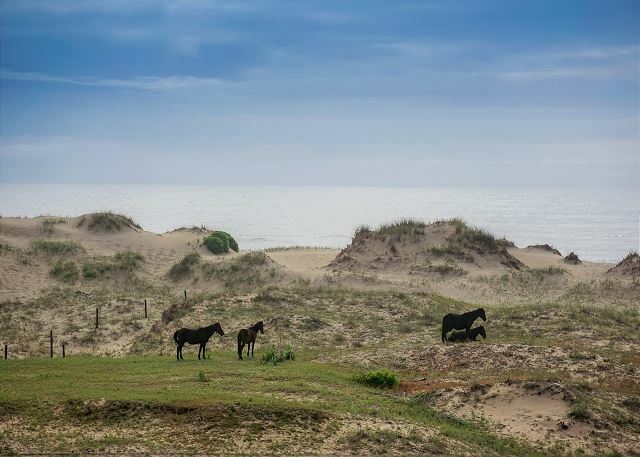 The wild horses are a magical touch to an already breath taking area. Since the home is located in a remote 4X4 only accessible area, internet and cell reception are not always the greatest. It's ideal for those looking to truly "getaway from it all". 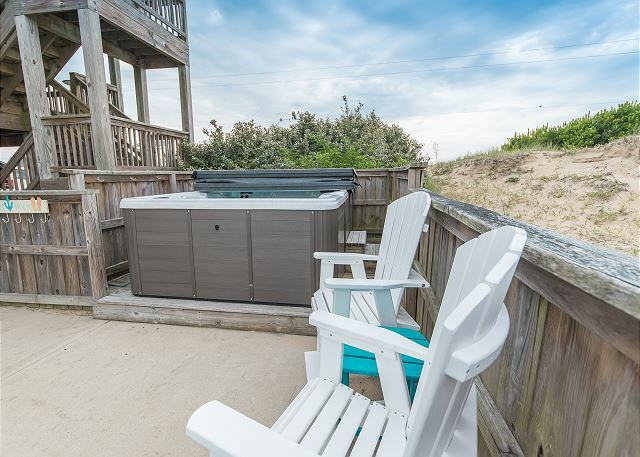 We do hope you'll recommend this property to others and return with Kitty Hawk Rentals in the future. After years of placing work first and vacations second, I am pleased to say that our family enjoyed every minute of our stay at "Barefoot Beach!" It was everything and more, as described by the rental company. 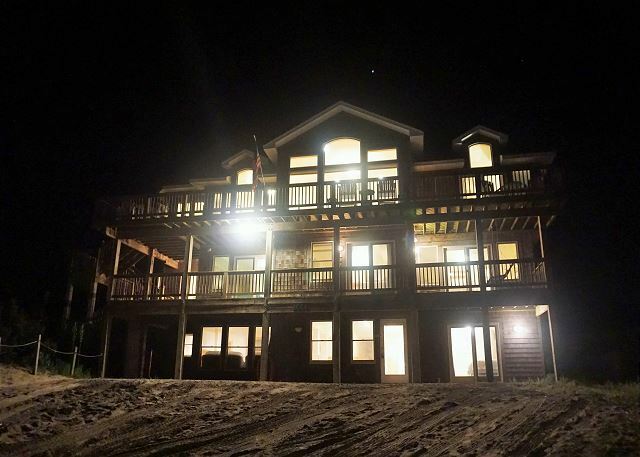 I would highly recommend this property to anyone looking for the priceless grandeur of the real OBX! Only issue, hot water had a slight smell, the hot water heater may need to be drained or replaced, (this is typical when not used frequently). House was clean, neat, and modern. Pool and Hot Tub were clean and enjoyable as well. Thank you for taking the time to leave us a review regarding your stay at Barefoot Beach! We will look into the water heater but I'd like to note that the 4X4 area homes water is supplied via private wells. All of our homes do have a filtration system so it is safe for drinking, cooking, etc. But at times the smell of the water can be noticed. Usually can be resolved by tinkering with the filtration system, just be sure to notify us. We hope to have you return in the future!! We're so happy you enjoyed the home, we'd love to have you return. Thanks for posting. Our group of 18 just returned from our week in OBX and have much to share with anyone planning to stay in this great house. It was absolutely perfect for our group. With 10 teenagers and 8 adults everyone had plenty of their own space and the kids were thrilled to have the lower level all to themselves. The beach was incredible. A 5 minute walk from the house or a 2 min. drive in the jeep was no big deal and we went back and forth multiple times a day. Horses... so many you simply got used to seeing them everywhere. Totally awesome! The house was very well equipped with every kitchen gadget you could ever want. Beds were comfy, plenty of blankets etc... The trip into town where the closest store is will take you nearly 30 minutes each way, well planned shopping lists are a must. BEWARE... the house comes with NO paper products. No toilet paper or paper towel. NO soap of any kind. After a 14 hour drive we were very bummed to have to go back out to get these things. Also... shower towels are provided but NO beach towels and you will really hate the shower towels they give you. Very small and rough like sand paper. Bring your own if you can. The house was pretty and clean with a few exceptions. The dishwashers had dirty dishes in them, and believe it or not someone put 2 gallons of ice cream IN THE GRILL... imagine our surprise when we went to cook up dinner. It was a sticky melty mess, it took a while to clean that up. Our ice maker was broken, we had someone out twice to fix that but they did get it fixed near the end of our trip. The pool is even smaller than it looks in the picture but the hot tub is even better than it looks in the picture seating 8 comfortably!! Would we return to this house? I think so... we'd bring towels, TP, and more Tito's and Tonic!! 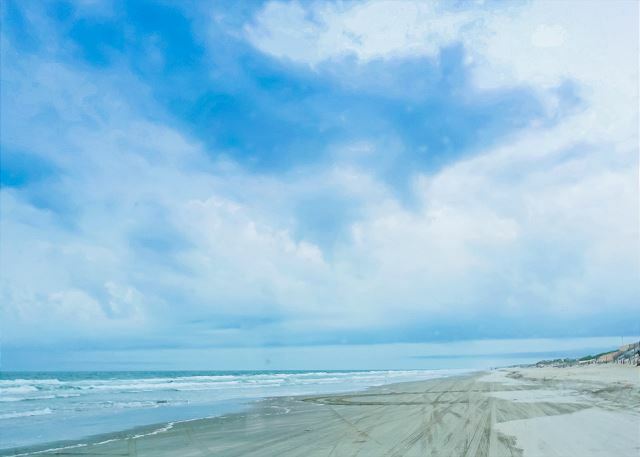 It's very remote but the 4x4 beach is a really cool way to experience the Outer Banks!